Posted	 07:57 AM	 by	Irène Cherpillod	& filed under	1. Resources, D. International Laws	. As a result of the financial crisis of 2007-2010, significant changes were made to the financial legislative framework of the United States of America. The most important reform is the Dodd–Frank Wall Street Reform and Consumer Protection Act, which came into force in 2010. This Act is also referred to as the Dodd-Frank Act. Within this new legal framework, companies are obliged to disclose information on the use and origin of conflict minerals such as tantalum, tin, gold or tungsten (Section 1502 of the Dodd-Frank Act). 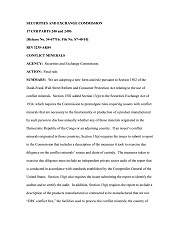 With this section of the Dodd-Frank Act, the American Congress sought to address the problem of so-called conflict minerals causing violence and destitution in the DRC. The Dodd-Frank Act seeks to prevent the financing of armed groups through the exploitation and trade of minerals in the Great Lakes Region. the minerals are necessary to the functionality or production of a product manufactured or contracted to be manufactured by the company. This means that not only companies using conflict minerals directly in the production or processing of a product have to comply, but also companies which have a certain level of influence over the manufacturing process of a product containing these minerals. Thus, even some retailers who are not themselves manufacturers, but sub-contract the production of a specific item for them, have to meet the US Conflict Minerals Law’s requirements. The law applies therefore to the entire supply chain of a product. The law does not apply to companies that have no influence over the manufacturing of the product. This is the case if a company sells a generic product manufactured by a third party; it also does not apply if the company maintains or repairs a product that has been produced by another company; or if it negotiates or specifies a contract with a manufacturer that has himself no direct influence over the manufacturing of the product. Only in these cases are the companies exempted from meeting the law’s requirements. Useful information can be found in the Fact Sheet “The Use of Disclosing Minerals” and the Final rule published by the US Securities and Exchange Commission. For a direct access to theses documents, click on the pictures below. 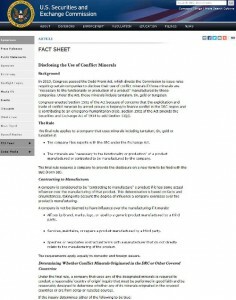 Summarised information about the Requirements of the US Conflict Minerals Law can be found under this page. An interesting report that provides a clear overview about the facts, content and scope of the US Dodd-Frank Act can be accessed through this post. This is a report published by Global Witness.